Industrialist and engineer manufacturer of factory steam engines. He was resident engineer for the North Union (Parkside to Preston) Railway. Musgrave & Sons manufactured the ironwork for the 710 metre long Tsar Nicholas I Suspension Bridge across the Dnepr river at Kiev in the Ukraine, opened in 1853. The family later expanded its business interests into the cotton trade eventually owning 5 mills around Chorley Old Road, Halliwell. Represented East Ward 1874-77. Alderman for the new Halliwell Ward 1877-88 having previously been a member and Chairman of Halliwell Local Board of Health. Appointed Magistrate in 1867. He was Chairman of the Waterworks Committee. Chairman of the Building Committee of the New Infirmary and laid the cornerstone on 1 May 1880 and opened Bolton New Infirmary and Chadwick Children's Wing on 21 July 1883. The male accident Ward was named the Musgrave Ward. The Musgrave family gave £5,000 towards the building of the New Infirmary. Gave the first Mayoral Juvenile Ball in Bolton. 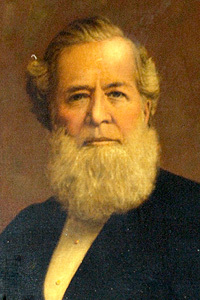 First President of Bolton Chamber of Commerce 1887. He was a Wesleyan Methodist. He laid the foundation Stone for Cable Street Wesleyan Chapel and gave money for the purchase of land for St Luke's Church. His second wife, Amelia, was Mayoress. 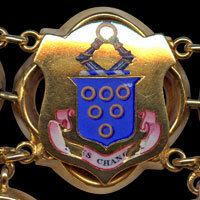 Joseph Musgrave's link on the Mayor of Bolton's Chain of Office. Azure six annulets 3:2:1 or. Crest - On a wreath argent & azure two arms armoured and embowed clasping an annulet or. The Musgrave arms are famous - including three peers, an archbishop and an Oxford Professor but no connection to the Bolton Musgraves is proven.